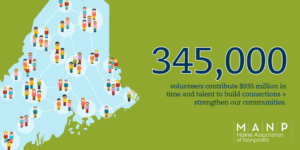 Public policy should recognize and support the important roles of volunteer service and private philanthropy in improving the lives of citizens and the quality of life in Maine. MANP supports public policy that increases the number of volunteers. MANP opposes public policy that places undue burden on organizations that effectively utilize volunteers. In addition to favorable tax policy, MANP supports public policy that assists fundraising and increases charitable giving to the sector. We support the reinstatement of these incentives, retroactive to January 1, 2014. Together with the Maine Coast Heritage Trust and the Good Shepherd Food Bank, we have sent a letter to all members of our US Congressional Delegation urging action. For more information, please visit Independent Sector’s website on the issue. A charity’s ability to reimburse volunteers for expenses incurred while volunteering plays a huge role in nonprofit organizations’ abilities to recruit and retain volunteers. MANP believes that Congress should take action to exempt reimbursement of mileage from income and raise the volunteer standard deduction to a reasonable rate. Currently, charities may reimburse volunteers, on a nontaxable basis, up to the charitable mileage rate of 14 cents per mile. That rate has not changed since 1997 and no longer covers the price of gas. In addition, if charities reimburse their volunteers more than the 14 cent mileage reimbursement rate, volunteers pay taxes on the additional amount because it is treated as income thus, taxing individuals for donated services. Visit Independent Sector’s website for more information on this topic. MANP supports legislation that increases and preserves charitable giving incentives. This includes, but is not limited to, the IRA Charitable Rollover, deductions for non-itemizers, and enhanced deductions for volunteers and for charitable contributions of in-kind donations. Recent History of the Charitable Giving Incentive: From the Fiscal Cliff debates to the annual budget wrangling, the charitable giving tax deduction and other incentives have been both threatened and enhanced by various proposals. Read the National Council of Nonprofits’ summary of the recent history. Non-Itemizer’s Deduction: Almost 70% of Maine tax payers do not itemize their deductions and therefore receive no tax advantage for their charitable giving. What would the cost to the federal and state treasuries be compared to the increases in charitable giving? In 2002, the Center on Budget & Policy Priorities did an analysis of proposed federal legislation to allow a charitable deduction for non-itemizers and determined the cost to the treasury far outstripped any additional giving.